Comet ISON, which has orbited the Sun among the objects of the Oort cloud for almost 4.5 billion years, perhaps as much as a light-year away from the inner Solar System, has remained largely untouched since the time of the Solar System’s formation. Since it was first detected nearly a year ago, astronomers hoped that its passage would offer a unique glimpse of the state of our Solar System in its earliest moments. Links: Updates from Sky & Telescope magazine; ISON movie from SOHO’s coronagraph; ISON image gallery from Spaceweather.com; NASA Comet ISON Observing Campaign website. The November 11, 2013, Astronomy Picture of the Day shows the total solar eclipse of November 3, as covered by several different solar observatories. Credit and copyright: D. Seaton (ROB), A. Davis & J. M. Pasachoff (Williams College Eclipse Expedition), NRL, ESA, NASA, NatGeo. The innermost image shows the Sun in ultraviolet light as recorded over a few hours by ESA’s PROBA2 mission in a Sun-synchronous low Earth orbit. This image is surrounded by a ground-based eclipse image, reproduced in blue, taken from Gabon by Allen Davis and Jay M. Pasachoff during the Williams College Eclipse Expedition. Further out is a circular blocked region used to artificially dim the central Sun by the Large Angle and Spectrometric Coronagraph (LASCO) instrument of the Sun-orbiting SOHO spacecraft. 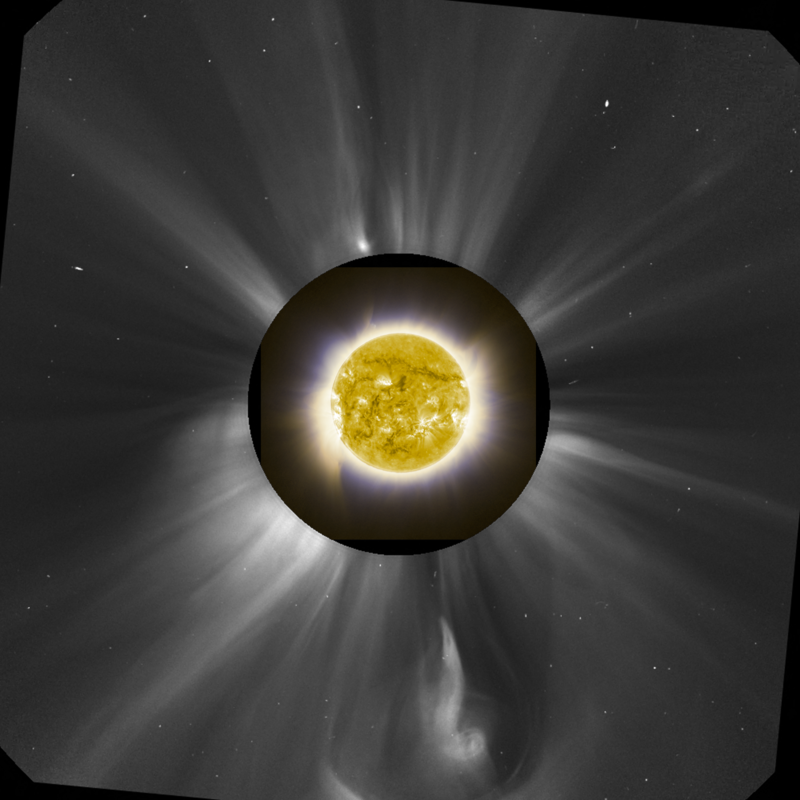 The outermost image – showing the outflowing solar corona – was taken by LASCO ten minutes after the eclipse and shows an outflowing solar corona. Over the past few weeks, our Sun has been showing an unusually high amount of sunspots, CMEs, and flares – activity that was generally expected as the Sun is currently going through Solar Maximum – the busiest part of its 11 year solar cycle. This image is a picturesque montage of many solar layers at once that allows solar astronomers to better match up active areas on or near the Sun’s surface with outflowing jets in the Sun’s corona.